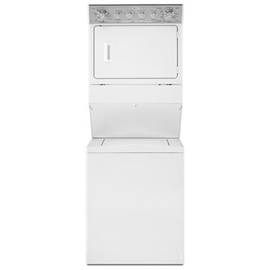 For the efficient cleaning and drying of your laundry, MET3800TW from Maytag is one of the units you should consider. This combo washing/drying unit has various features that could aid you in dealing with your laundry. Read the article and learn about the features of this model including the reviews of the consumers regarding this item. - Dependable Wash System - This system is designed for reliable cleaning. - Gentle Breeze Drying System - The Gentle Breeze Drying System ensures that your clothes will be dried with care. - Self-Cleaning Lint Filter - The self-cleaning lint filter makes this machine easy to clean and manage, reducing your effort spent on cleaning this machine. - 9 Wash Cycles - The nine wash cycles ensures the thorough cleaning of your laundry. - 6 Dry Cycles - Ensures the thorough drying of the materials. Also gives you the option regarding the drying level for specific materials. - End-of-Cycle Signal - This indicates that the washing is done and you can proceed to the next set of load. - Delicate Setting - This feature makes sure that your delicate clothes are well-taken cared of. - Extra-large Door Opening - This allows you to put your laundry on the unit without difficulty. - Four Water Temperature Combinations - This gives you the option for the water temperature for the thorough cleaning of your clothes. - Loadflex Agitator - This feature makes the machine powerful enough to make your cleaning and drying efficient. One of the best things about this combo washer/dryer is its space-saving feature. Even if you have a small laundry area, you can still save space if you use this combo washer and dryer. This unit is also easy to clean and to maintain. It's self cleaning feature is an excellent way to reduce lint build-up. The machine ensures thorough cleaning of clothes. But at the same time, it also makes sure that the delicate materials are taken cared of. This is through the machine's 9 wash cycles option and delicate setting feature. Using this unit also lends efficiency. with this model, you can easily load the laundry through the large door opening of the washer and eye level door of the dryer. For some consumers, the best thing about this model is that it minimizes the noise during the operation. with this unit, you can wash and dry the laundry even if your baby is fast asleep. Despite the excellent features of this unit, it also has some disadvantages. One of these is the very limited option for the color and the design. This washer/dryer is only available in white color. Aside from this, it does not have a sensory dry of dry rack features that could have aid the drying of your clothes. Join in and write your own page! It's easy to do. How? Simply click here to return to Maytag Washer Dryer Combo.